This is a drawing tool I developed in my spare time, it can draw rectangle, circle, and other shapes, you can also move, resize, even rotate some of the shapes. It will be a useful starting point of a complicated graphics project. To fully understand this code, the user has to understand some of the C# concepts, reflection, interfaces, inheritance, etc. 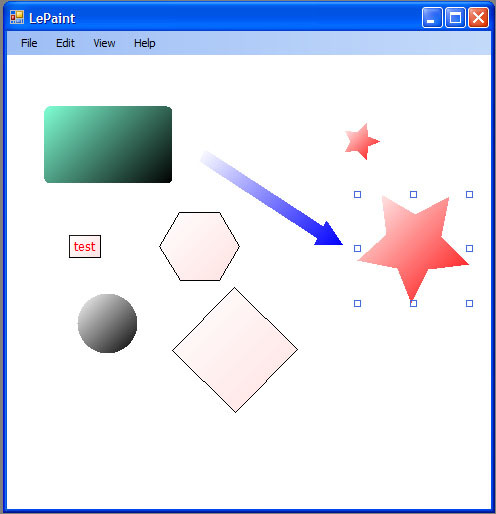 There is another version of this drawing tool by using WPF, you can find it on Graphics Drawing Tool WPF.aspx. This project also comes up with a propertybag for user, to dynamically change shape border color, fill color, arrow width, text box content, text size, etc. This project finally provides the user with an option of exporting the drawing as XML file or jpg file. With the above XML file, the project can open this file next time, users can keep editing their drawings. Once finished, users can choose export it to jpg file. Following is the explanation of the project. As we can't serialize C# Font and Color class to XML, I created their equivalent structures and used them everywhere. As you can see, this LeShape class is abstract class, as we don't want user to instantiate it at any time. Instead we create ZoneShape, Rectangle shape classes based on this LeShape, then we instantiate them, it makes more sense. In order to let user move, resize shapes, I made another class BoundaryShape, it inherits from LeShape, which contains all the properties, while this BoundaryShape only handles user's mouse movement, and it won't be serialized to XML file. Basically all the shapes will be inherited from BoundaryShape, and BoundaryShape inherited from LeShape. We can have corner radius shape, by default radius is 10 px. We used the following paint method to draw this cornered Rectangle shape. 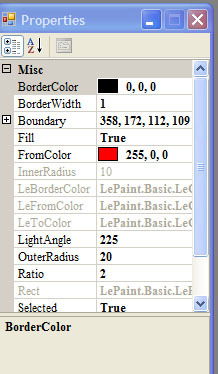 This paint method has a copy in BoundaryShape, we don't want to use it, therefore we put override as modifier. You will also see the LeShape implemented IShape interface. I made LeShape's IShape implementation virtual method. Then at its inherited classes, selectively rewrite these virtual methods. ZoneShape has a text field, the idea is when ZoneShape moves, text field moves as well. This is achieved when user has finished move zoneshape, then raise an event at BoundaryShape, ZoneShape accepts this event then processes this event, moves the text field parameters. User's mouse movement was handled by LeCanvas class, LeCanvas class then passes this event to all its on screen shapes. Each shape then decides its actions. Either it's a drawing start, or move a shape or resize a shape.